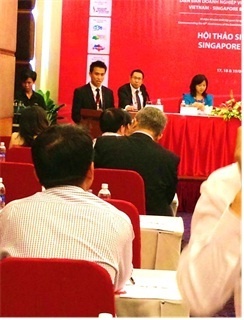 The Vietnam Chamber of Commerce and Industry, in cooperation with the Singapore Business Federation, organized the Vietnam Singapore Business Forum from 17th to 19th of April 2013 in Ho Chi Minh City. The objective of the event was to enhance cross-border business corporations with corporate leaders from Singapore and Vietnam. The event attracted over 100 business entities and officials from both countries whom attended presentations and panel discussions on Real estate, Tourism, Healthcare services, and Manufacturing and logistics; and a business networking event organized by the Singapore Business Group. Mazars was represented by Mr. Tan Ping Yong, a Senior Consultant from Mazars Singapore, who delivered a presentation on the topic ‘A guide to doing business in Singapore’. This specific topic presented a broad view about the benefits of doing business in Singapore, taxation and legal process to open and run a business in Singapore. With his 4 years’ experience at the Singapore Economic Development Board and now helping Mazars clients to invest in South East Asia, Ping Yong has the perfect background to support Vietnamese and international businesses in their future investment in Singapore. According to Ping Yong, Singapore’s role as a business hub for the region should continue to grow, well supported by the increase in regional markets connectivity, extensive bilateral agreements, and the well-known Singapore hospitality toward businesses ( ranked as number one out of 185 countries in the ease of doing business index). Mazars Vietnam was well represented by its specialized team of Outsourcing and Business Advisory, led by Mrs Nguyen Thuy Hai, Director of Outsourcing and Business advisory and Mr. Boris Gueudin, Manager in Audit & Business Advisory. The Vietnam Singapore Business Forum is one of the first activities to commemorate 40 years of diplomatic relations between Vietnam and Singapore, and the anticipated signature of Strategic Partnership Agreement between the two countries in 2013. 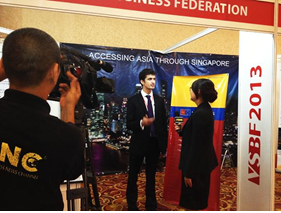 The Financial and Business News Channel (FBNC) conducted an interview with Mr. Boris Gueudin, an Audit & Business Advisory Manager on the future of ASEAN economic integration and the role that Vietnam and Singapore in it.